The Cobalt® 9940-ACO 3G/HD/SD-SDI Multi-Input Intelligent Auto-Changeover Switch with Optional Trouble Slate Inserter allows manual selection of input, or failover to alternate inputs (Auto-Changeover) on loss of input conditions as well as user-configurable Video Quality Event intelligent assessments such as black/frozen frame or audio silence. Also included standard is closed captioning absence/presence detection for CEA 608/708 and line 21 SD closed captioning. Video Quality or Closed-Captioning event status can independently be propagated for each event type as GPO, automated alert email, input routing changes, or card user presets you can configure to provide any number of special actions such as routing changes or burn-in text alert messages. A user trouble slate graphic file can be uploaded to the card, which in turn can be automatically inserted in active video if any Video Quality Event triggered errors occur. The 9940-ACO is also available in stand-alone form factor BBG-1040-ACO. Multi-input, with manual selection or Intelligent Auto-Changeover failover. 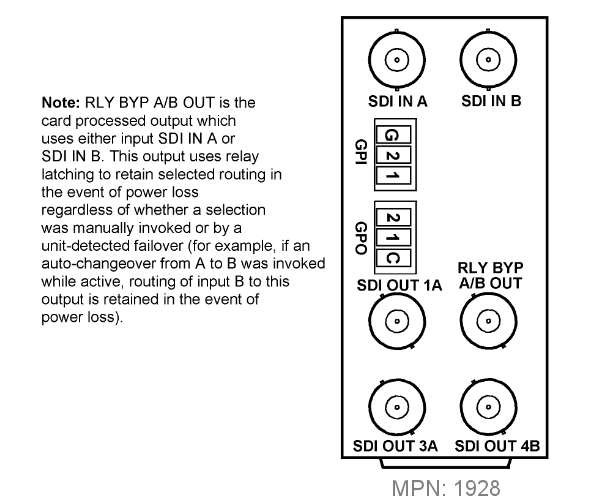 Latching relay bypass retains manual or failover input-to-output routing even in the event of power failure. Intelligent Auto-Changeover can be set to invoke failover or alerts for basic input loss as well as intelligent failover/alert based on black/frozen frame or audio silence. Threshold and hold-off are user configurable. Frame sync with full H/V offset and manual/LOS video pattern generator. Frame sync can also convert raster format between 29.97/59.94 and 30/60 formats. Manual selection (forced) of any input. Failover to alternate input on loss of target input. Failover invoked upon LOS or user configurable parametric criteria such as black/frozen frame or audio silence. - Black frame trigger configurable for black intensity threshold and persistence time. - Frozen frame trigger configurable for frozen percentage difference and persistence time. 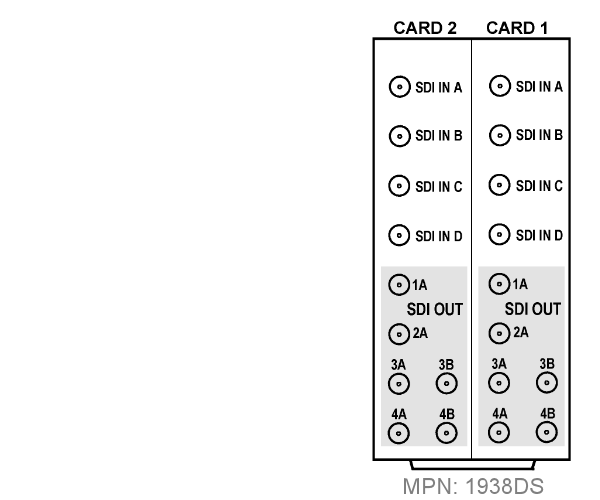 - Audio silence trigger configurable for dBFS floor threshold and persistence time. Relay latching for manually or failover selected path retains routing in loss of power conditions. (2) independent strings supported. Independent insertion controls for enable/disable and enable upon LOS. User controls for text size and H/V position. 16-ch embedded. 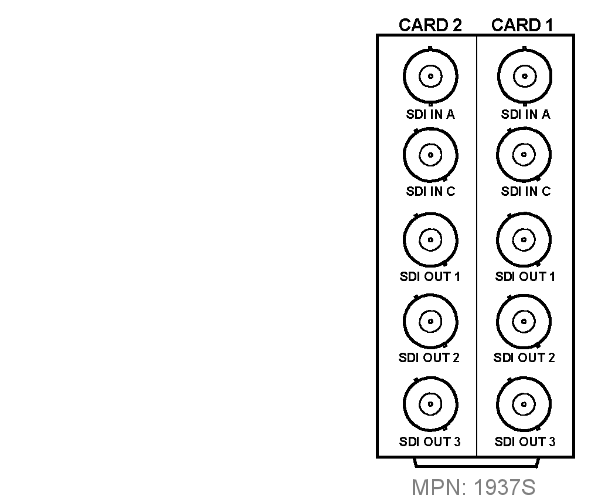 User crosspoint allows routing of any embedded channel to any embedded channel output. Multi-frequency tone generator for each audio output. Downmix output available for any output channel pair. Master delay control; range of -33 msec to +3000 msec. 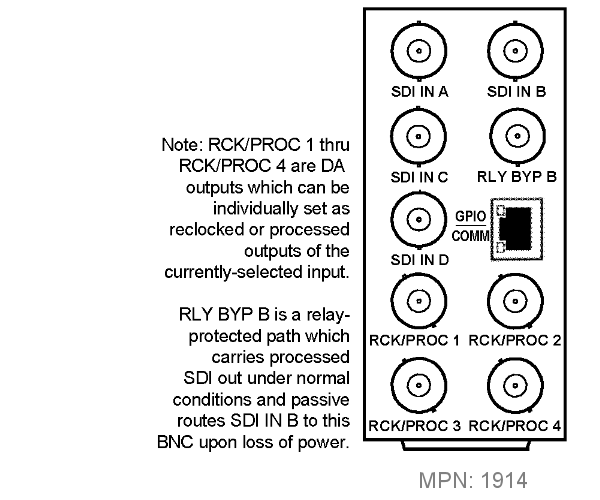 (2) GPI configurable to select input routing. (2) GPO configurable to invoke upon input selected. You are currently requesting a quote for 9940-ACO.